This page describes a tool I wrote many years ago (in the case of WMIDI, it was created in 2006). You will probably need to fiddle around to make it work on a recent machine (hunt down old MFC libraries etc…) and I don’t give any guarantee of any sort about its state or usefulness. To make it short: you are on your own! Wmidi transforms your graphic tablet into a musical instrument and a MIDI controller. It is able to generate notes, but also control change messages depending on the position, pressure, Z angle and tilt of the stylus on the tablet. It was initially written and tested for Wacom tablets but since it is using the WinTab API, it should be compatible with all kinds of tablets. 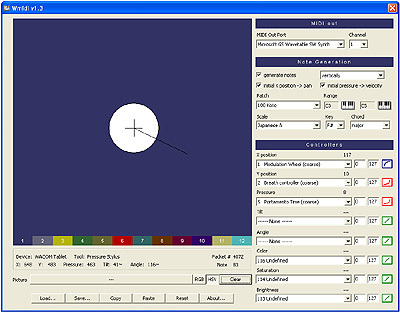 The colored area corresponds to the graphic tablet. The position of the stylus on the tablet is represented by a cross. A line is drawn to show the orientation of the stylus, as well as a plain circle, which corresponds to the pressure. In order to generate music that does not sound totally random, Wmidi only plays notes from a chosen scale (amongst 270 available scales). The notes are automatically triggered while moving the stylus on the tablet. If your stylus has an eraser, you can use it to trigger chords instead of single notes (24 types of chords are available). If you click on the first button of the stylus, the current note or chord is locked and moving the stylus on the tablet will send control change messages. Control change numbers can be selected for the X and Y coordinates, the pressure, the angle and the tilt of the stylus. For each of them, you can also specify the range of values that will be generated, and a mapping curve. All these settings form a configuration. You can edit up to 12 configurations and recall them at anytime during a performance. Starting with version 1.3 of Wmidi, it is possible to load a background picture. When moving the stylus on the tablet, the color of the pixel under the cursor will be analyzed. Then the corresponding control change messages will be sent for the hue, saturation and brightness or the red, green, and blue components. There is plenty of room for experimentation. For example, you could load a stone / rocky texture, and use the brightness to drive the friction parameter of a physical modelling synthesizer. Wmidi lets you select the MIDI port to which the messages are sent. You can connect a synthesizer directly to that MIDI port. For example, I have been using the Nord Modular from Clavia. Its modular architecture allows you to create elaborated patches that will evolve in time, and every parameter can be assigned to a MIDI controller. You can also route the MIDI out port selected in Wmidi to the MIDI in port of any other MIDI program (sequencer, softsynth, etc…). A way to do that is to use a virtual MIDI device such as Hubi Loopback Device. For example, you can record the control change messages generated by the stylus movements on the tablet, and add them to a pre-existing track. It’s a good way to add life to a static part. Click here to download Wmidi. You just need to unzip the file and the program is ready. Make sure you read the documentation. Your old program works with windows 10 and I can use it with Cubase elements and ableton light I had to find a newer loopmidi on line that works with Win 10. If u ever update Wmidi please let me know. Thanks for the use of Wmidi. Thank you for the information! Indeed I’m planning on releasing a new version of Wmidi in the not-too-distant future. I will put it on this web site. Cheers. If/when WMIDI is updated, are you going to make it compatible with the more modern pen and touch capabilities of Wacom tablets? It will definitely support the newer Wacom tablets. What specific capabilities did you have in mind? Thanks for answering. I simply wanted to see if the multi-touch capabilities of the Intuos line (I have the Intuos 5) could be translated in some way through WMIDI. To be able to use the fingers instead of the pen all the time would be great (though the pen functionality is quite cool). The two finger zoom and rotate gestures, for example, could control certain parameters of a synth, etc. Just having the tablet as a large touch X-Y pad is interesting. Could the ExpressKeys and Touch Ring be utilized within WMIDI? I’m not really presenting any new ideas – you have probably thought about this before. An updated WMIDI would be amazing. Do you have an ETA for WMIDI? I am interested if the software “Theremine” is somehow available, because I always end up with dead links. It’s a great concept and I wanna try it. Tried Wmidi. So far so good! Hello. Sure, I will add the Theremin program soon. It will take a few days as I’m travelling right now and don’t have access to that project. I’m interested too. Can you upload it, please? Also very interested in the Theremin, where can i find it? I’m interested too in “Theremin”!!! Can you upload it, please? I agree, seems awesome to use man! Just like wmidi! Hi, So cool to be able to use my tablet for midi input! Thanks for the free program. I’d love to see an update but in any case this is awesome! I just got this to work on Windows 10. Had to download a missing mfc71.dll, which I dropped in the same folder as Wmidi.exe and it just worked. I downloaded the dll from https://www.dll-files.com/mfc71.dll.html. I ran it through the virus scanner at http://virusscan.jotti.org/ and it came up clean and no problems so far.